Although I’d finished what could be described as regular passenger services in Germany I still had (and have) a number of oddments with summer weekend only services, preserved lines and the like. Enough of these were scattered around Baden-Württemberg and neighbouring countries to make a worthwhile weekend so I entrusted myself to Ryanair (since no-one else goes to Friedrichshafen from the UK) and went for a weekend venture. Off to STN in the Tractor, leaving at 0810 and arriving about 1140 after a detour to the chaotic (lorry park being dug up) Birchanger Services. Reasonably prompt bus to the terminal where on line check-in (done on Wednesday) saved me from the horrendous Ryanair check-in queues. [Money very well spent if you can manage with hand baggage only]. No such luck with security at first – huge queues but by sheer good luck I was (twice) at the right point in the queue when new gates opened and was through in 10 minutes or so. Ryanair’s customer desk was tiresome, with an outstandingly tedious American causing scenes from ‘Airline’ [a UK television ‘reality’ program showing the daily life of Easyjet. This individual should realise that basically, you get what you pay for. You may not get much other than transport from RA, but then again you don’t pay much either.]. However my £2 online checkin paid dividends again with seat A1 on the 737! All this after a pint of quite good Abbot for £2.09 in the airside ‘Spoons. Pilot Russian (I think), FO Greek (I think), cabin crew Eleonora, Gabriele (male) and A.N. Other (female) all neither Irish nor British. [Ryanair are nothing if not multinational] Anyway we landed more or less on time, and very firmly, at Friedrichshafen with plenty of time before 1655 to Ulm. I caught the preceding BOB kart to Ravensburg, thence tilting rubbish 611 017 working the IRE. 7 late, wedged and with failed air con. Just like home. Problems at Ulm Hbf where (although at least a Paulaner weissbier was obtained) 1812 RE to Neustadt (Schwarzwald) proved to have a defektiv 4 car push pull set. This was dragged away by a gronk after some delay, while its Rabbit (218 165) was despatched to look for some coaches. It eventually found 3 and departed about 10 late. No air con, broken or otherwise, but the windows work and the beer’s nice! On arrival at Ehingen the hotel was located easily enough – no early breakfast but they were decent enough to knock EUR6 off without even being asked. A pleasant establishment too (Ehinger Hof). Ehingen having been selected because of its 3 brewery taps, what could I do? So off to the Bräuerei Rössle, the largest of the three. The brewery was easy enough to find – the tap therein, not quite so easy. After blundering into various bits of the brewery I eventually found it on the first floor. A real drinking club, but the landlady (I think brewery owner too) spoke some English and went out of her way to make me welcome. Nobody else spoke English but I got a friendly response when I wished then all goodnight as I left. A good example of why I’m so infuriated by the anti-German attitude of our gutter press. Beerwise, there was light and dark. I chose light as ever – a very pleasant beer, malty and sweeter than ‘oop north’ and in the ex-DDR. 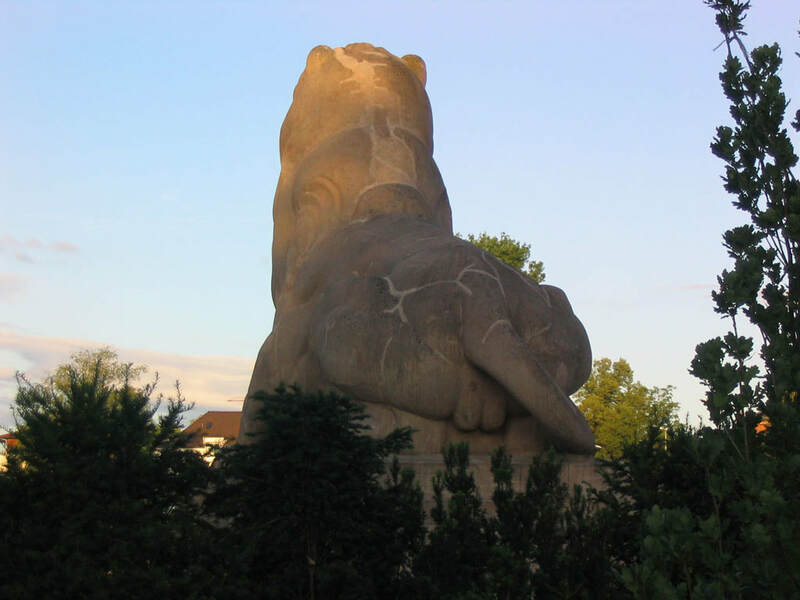 Typical of Baden-Württemberg I guess. And so to Zum Schwerte, a more (but not entirely) restauranty pub. A cracking weizen hell and not a bad schnitzel either! They have quite a range but as I’m on a mission (and have an 0600 start) the weizen will have to do. It’s got a lovely spicy air about it though. Last port of call was the Swan (Schwanen Gasthof Bräuerei). This was the nicest of the three as a pub, and highly organised with two nice young ladies trotting round dealing with the orders. Smart and efficient – surprisingly the Grillabend advertised for tonight didn’t seem to be a hit, though no reason was apparent. I chose the Zwickel this time – can’t really get to grips with Zwickel though I don’t know why not because it’s perfectly pleasant. Nothing to compare it with, I suppose. Anyway, it was unfiltered, roughly Dabley coloured and really very drinkable. I called it a day at that and retired early, pausing only to note that all three beers weighed in at under £2/pint – no, I’m lying, the Zwickel was about £2.30. Not a particularly interesting start to the trip! But which would you rather ride in - one of BOB's smart new single units or one of the more wretched ex BR 153s? To give the 153s their due, the view from them is better because they don't have the silly diagonal supports in the window spaces. 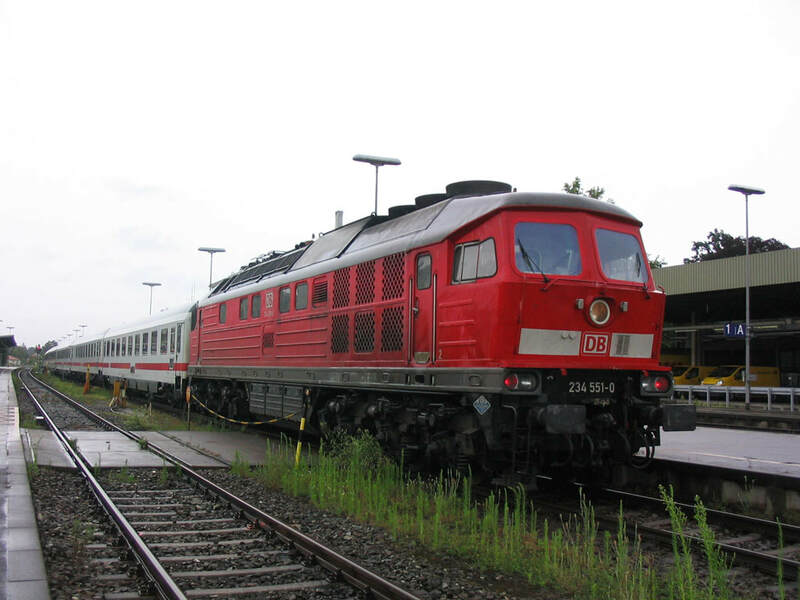 This unit is at Ravensburg on 29.6.07. 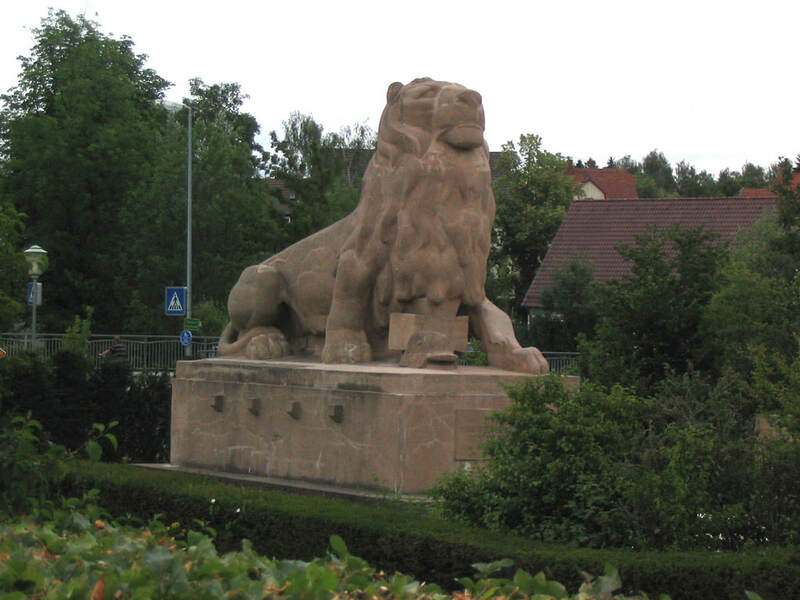 This remarkably snooty lion guards the approach to the station at Ehingen (Donau) where I stayed the night. A very uncomfortable night to my surprise; an unusually inadequate pillow combining painfully with a rock hard mattress! However I did get some sleep and set off to the station at 0600 under blue skies. 0623 RE to Neustadt (Schwz) was unfortunately tilting rubbish 611 023 – I’d hoped for another Rabbit. It’s a long trog to Donaueschingen particularly when there’s a 23 minute booked stop at Tuttlingen! Interesting scenery after Sigmaringen though and there’s still that strange enclosure full of rusty Kriegs just west of Tuttlingen. On to Villingen on one of HzL’s trapezoid windowed things. Although booked as a through working we were turfed out at Villingen while they went to collect the extra unit for Trossingen. Gave me time to get a coffee anyway. I’d guessed correctly that the rear unit would do the Trossinger Eisenbahn though it took some time before the display reflected this. Trossingen Bf has been moved 100m or so towards Rottweil and is now just east of the goods shed. It has one straight and very narrow island platform, P12 for Rottweil <-> Villingen and P1 for the branch. The branch has been realigned to pass west of the old station building (it used to pass east). Why they run this working is a total mystery to me. There was a kart standing at T-Bf which could perfectly well have done the job. I thought it might be to swap units but no, the same one worked back and was attached, after some violence, to the Villingen bound unit at T-Bf. The ancient blue and cream electric was standing at T-Stadt, looking a bit decrepit. Back to Donaueschingen on the HzL unit; with half an hour to wait I settled for the station buff which – surprise, surprise – sells Fürstenberg, the local brew. Just like everywhere else in Donaueschingen, judging by my walk earlier. Considering how pale and thin it looks, it could be (slightly) worse. Not a match for any of last night’s, though. The buff is not notably friendly – Boris Yeltsin behind the bar was a man of few words, all of them German. Still, it passed the time until the IRE at 1113 to Singen. Which was reasonably civilised double deckers hauled by 146 229, a couple of minutes late. Only a minute late at Singen so there was time to dash along to the Hotel Victoria and check in for tonight, thus leaving me more room for manoeuvre later on. Breakfast from 0700 so no worries with post 0900 starts tomorrow and Monday. More tilting rubbish (611 013 and another) on to Biberach on an Ulm service. Quite busy but on time and the air con worked, so with a seat on the shady side I quite enjoyed the ride. What a nice town Biberach is. Just my sort of place. The shops were all packing/ed up, it being 1330 Saturday, but if in doubt head for the cathedral (or largest available church and/or the Altstadt)! Did this, to find a good old shindig going on, which featured loadsabeer and, inevitably, a bratwurst stand. Breakfast at last… a bottle of Gold Ochsen Original from Ulm for afters, and all was well. 628 347 provided the haulage for a 4 minute move to Warthausen. The Öchslebahn stock was waiting when I arrived – the loco, 1956 built ex-DR 2-10-2T 99 788 arrived a few minutes later. Waiting muppets seemed afraid to go near, so plenty of photo opps and a seat at the front. I missed 218 410 on the main line though (passed at 1425 towards Ulm so should be able to work out the train). I managed to pass up the opportunity to visit the International Button Museum (really) in the former station. 234 292 (I think – fast and unexpected) passed at 1432 on a southbound IC. The train has to stop to be flagged across each road, so not rapid progress. There’s a buff selling an excellent special beer (Öchsle of course) from Schussenrieder Erlebnisbrauerei of Bad Schussenried. €2 for half a litre. Only €8 for the fare too – don’t they want to make any dosh? A lengthy reversal was made at one of the crossings before Äplingen – turned out to be so that the crew could extinguish a lineside fire! A very pleasant run up to Ochsenhausen where there’s a buff (no, I didn’t visit) and some very smart loos (yes, I did visit). I retired up the road for a few hundred metres for a crossing shot and was just about to give up at 1630 when the train appeared (booked 1615 off O/hausen). Driver of the 1653 bus to Biberach happily accepted my BW-Ticket, saving €4 and half an hour in the process, so I had time to go and spend €2.50 in the Grüner Baum tap (bit bland but very spick and span, English spoken and on menu) on their excellent Original, which is well up to scratch. Back to the station for the 1818 IRE to Singen, accompanied by another Gold Ochsen from the bothy! 3 full karts on the IRE (611 032 for me) and no seats on the shady side yet. Still, there’s hope… 218 214 noted at Ravensburg, heading north to Ulm at 1850. Got a seat on the shady side, but no supper. You can’t win ‘em all. 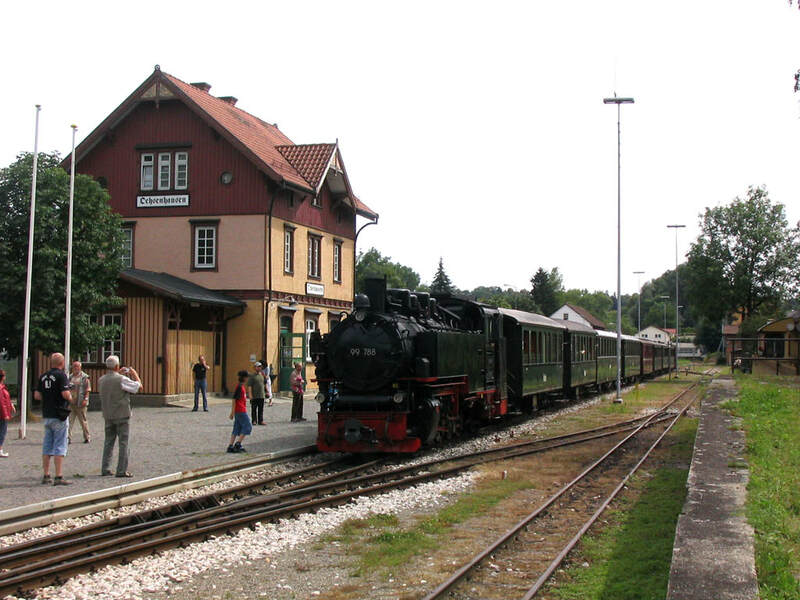 The next port of call was the Öchslebahn, a 750mm gauge line from Warthausen, on the Ulm-Aulendorf line, to the market town of Ochsenhausen. Here 99 788 (built 1956 at the Karl Marx loco works in Babelsberg, works no 132029) is running round its train before departure. At Ochsenhausen 99 788 has run round again and is waiting to return on the last run of the day. A shower and substantial breakfast much improved the day, as did the news of an internet café just down the street. Turns out it opens 10-22 on Sunday and 9-? on Monday so I should be able to check in for tomorrow’s flight if all else fails. [It did]. Off to Immendingen on a double deck RE propelled by a 146. Punctual arrival at Immendingen P3 (no idea why the ticket machine said P1 since you can’t get there from Engen!). Naturpark Express (2 HzL VT43s with a ‘BG equivalent’ sandwiched) appeared on time in P1. No junction problems as the Blumberg line goes off some way west of Immendingen (and on the other side from P1 of course). Yesterday’s HzL kart was billed as going to Geisingen-Leipferdingen (although advertised in the K-buch and on the yellow sheet as Blumberg-Zollhaus) so I was relieved when we passed G-L without stopping, albeit very slowly. Bit of a rush at B-Zollhaus, as you have to get your ticket (€11 single) from the ticket office and you’re allocated a seat, which is quite sensible as the train was heaving. Dainty (not) tank loco 86 333 was the traction. Luckily for me I was in coach 8 of 9 so got geographical overlap. At Weizen not quite so good as DB’s single unit waited for 86 333 to run round then came into the platform, leaving a gap small enough to phot without the wide angle! The line itself is fantastic – words fail me really but the map showing a mile long spiral tunnel at least gave me a hint of what was to come. Trolley lady came round with Rothaus Zäpfle which was very welcome as the jolly Germans will insist on having the windows shut on a hot sunny day! €2.00 for 0.33l is a bit steep (£2.60 a pint) but at least they’ve got more of a grasp on the captive market than the Öchsle! No sign of the Weizenzäpfle but when I asked in the buff approaching Weizen all was well and a bottle was purchased from a cheery bar lady to cater for the journey to Waldshut. Pretty tedious run from Weizen – severely speed restricted, flagged crossings and generally dreadfully slow (though not as slow as timetabled as we’d recovered the lost time by the time we reached the junction with the Schaffhausen-Basel line). After waiting time there we were spot on at the new station at Lauchringen West. With the IRE behind us I’d hope for no problem at Waldshut. There wasn’t. We arrived in P1; 611 532 on IRE-whatever at 1242 was less than 2 minutes late. A bit later at BBBf, delayed by what looked like a defektiv level crossing. No sign of any Internet at BBBf but at least there’s a McD’s for ‘ron so I don’t get stuck at Singen again. Travelex charge CHF1 commission, I discover, cheaper than the cash machine I guess. At Weil am der Rhein, ancient green electric 194 158 was to be seen – at Haltingen the Kandern line was being worked by a tank loco of astonishing vintage. Glimpsed from a passing train it looked like an 0-6-0WT. One for next time! On arrival at Müllheim rain was being attempted. It’s very muggy too, so the inside of a French SULFA with le air-con ferocieux was very welcome. Not very well patronised – a dozen or so, with only one joining from the southbound RE connection. Surprisingly, we acquired one more at Neuenburg. A pretty dreary line so far (written at Banzenheim, FR) tough with timber traffic at Neuenberg (DE) and a picturesque petrochemical plant just the French side of the river. Going across the flood plain it doesn’t really do scenery (nor speed). Copious car traffic further on, possibly Peugeot and certainly Citröen. Into Mulhouse Ville over most of the layout, not that it concerns me greatly. A rather forbidding looking station from the railway side, but inside bright and cheerful and with a sandwich counter to provide me with an excellent mayo-free baguette, clearly marked (or at least the shelf was) with its contents. Full marks, France! The shop had some interesting looking Alsace beer but cost, warmth and tasteless labelling discouraged me… some very swish trams outside, too. 1635 RE to Basel turned up on time back at Müllheim; the French kart had arrived 3 late at 1618 so there was time to purchase a bottle of Ganter (Freiburg) pilsner from the buff. €1.35 against the French €2.40 and probably better (though still not very exciting if we’re honest). My collection of Rhein Valley loops was added to when we were looped just north of Schliengen to wait for a southbound ICE and a northbound freight. We stopped in the northbound platform at Schliengen, probably a popular move as the road access is that side. A new tunnel is being built south thereof, presumably to bypass the reverse curves at Bad Bellingen (and even as far as Eimeldingen – would be interesting to know). 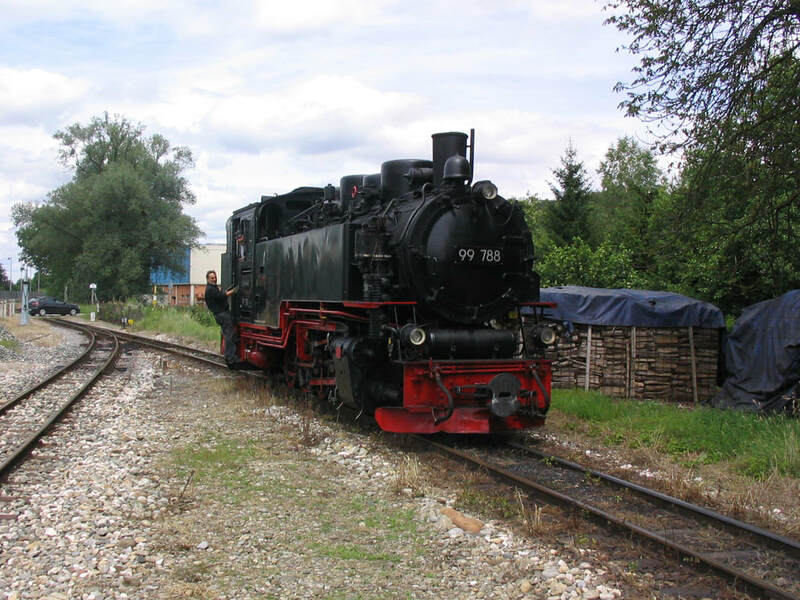 Right first time at Haltingen – the loco is indeed an 0-6-0WT. A real antique, well worth a visit. After a pretty fair run of luck, time for a slip-up. 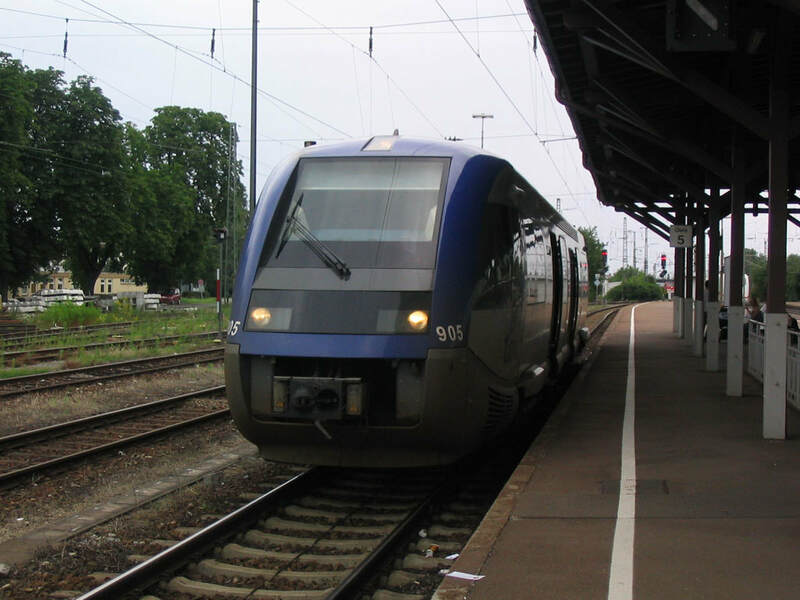 Due to the ICE/freight shenanigan the RE was 9 late for the 7 minute connection at Basel Bad. 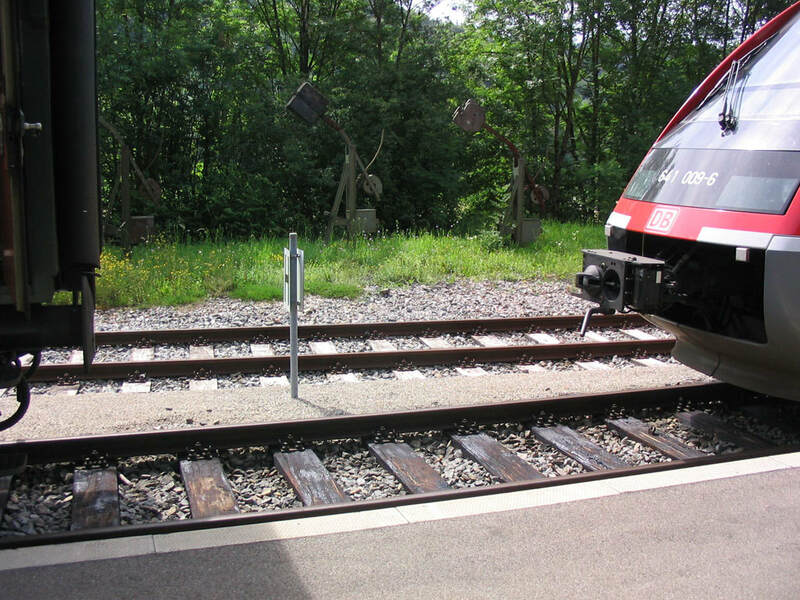 To make sure I missed it, the Swiss local to Basel SBB was replatformed and by the time I found it, it was pulling away a hideous 1½ minutes late! Just for interest I paid in Euros for a can of beer and a bottle of water in the station - €1.40 (CHF 2.30). don’t know how that works out, but it’s cheaper than Germany. The OFwBC strategy failed at about 1833 – the Bag On Seat one was still working (not for me, I consider it antisocial) at 1838 though the train’s absolutely wedged. And the muck that my neighbour is eating smells (and looks) absolutely vile. One item from the RE debacle was that it came in on P9, way over on the east side. May have got overlap somehow so it would be worth checking previous visits. IRE was completely wedged but on time and a boarding ‘card’ for tomorrow was obtained at Singen’s Internet caff for a princely €0.85. Judging by the outward flight, well worth every cent. 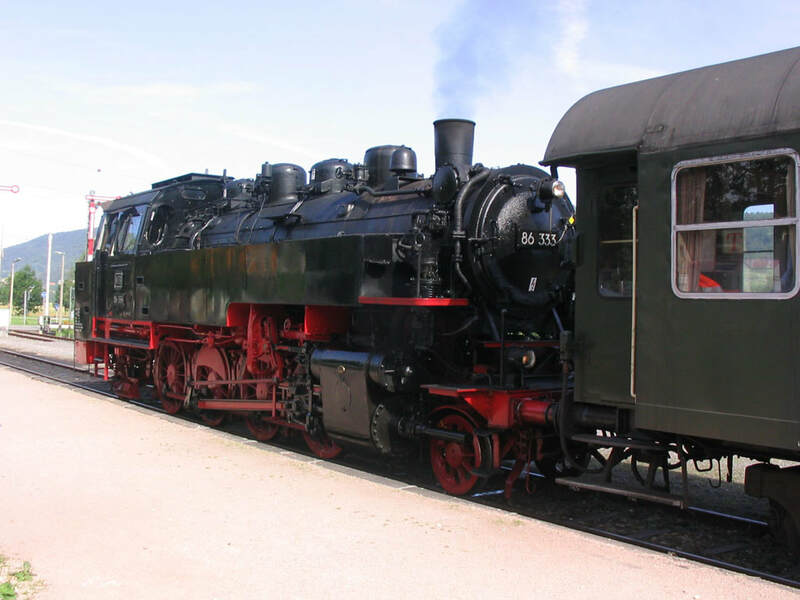 The following day, 1.7.07 brought more steam, this time a hefty standard gauge 2-8-2T 86 333, which had no trouble with its 8 coaches on the astonishing Sauschwänzlebahn in the Black Forest. This photo was taken very hastily at the eastern end of the line (Blumberg-Zollhaus). How to ruin a trackbasher's life. DB work a summer Sundays only service from the Sauschwänzlebahn terminus at Weizen down the freight line to Waldshut on the Basel-Singen line. Sadly the DB unit stopped just short of the mark! It's a pity they didn't wait for the steam train to go - but I think this is the prescribed move. From Waldshut I made my way post haste (and via Basel Badische Bf) to Müllheim (Baden) where I found French single unit 905 waiting to work the summer weekend only service across the Rhine to Mulhouse. The station building at Mulhouse looks very dreary from the outside - but it's cheerful inside with a particularly fine sandwich stall . 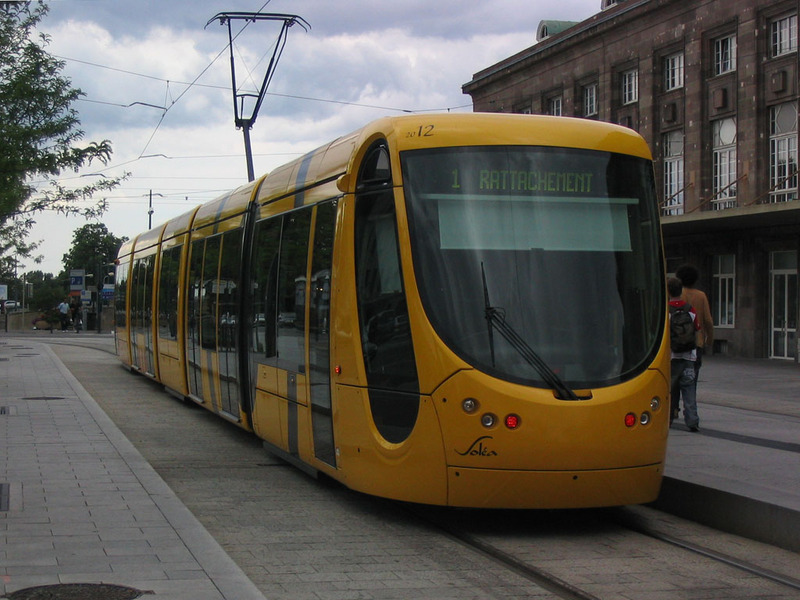 Outside was one of Mulhouse's very smart articulated trams. 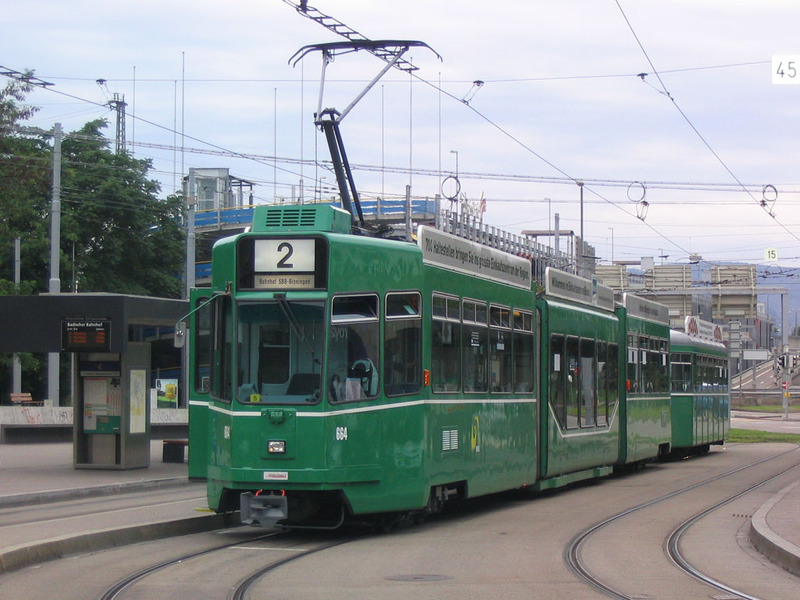 No amount of green paint and lining can disguise the hotch-potch appearance of these trams on Basel's route 2 which connects the DB and SBB stations. Heading west at Schaffhausen, the boxy 1960s lines of Re 4/4 11138 on a Cisalpino service contrast with the modern ICE heading for Zürich. Up in a mighty rush, it having dawned eventually that there are no time restrictions on the Euregiokarte. Made the 0834 (could have been 0734 and more track if I hadn’t been so dim) with comparative ease on a damp-to-wet grey morning. 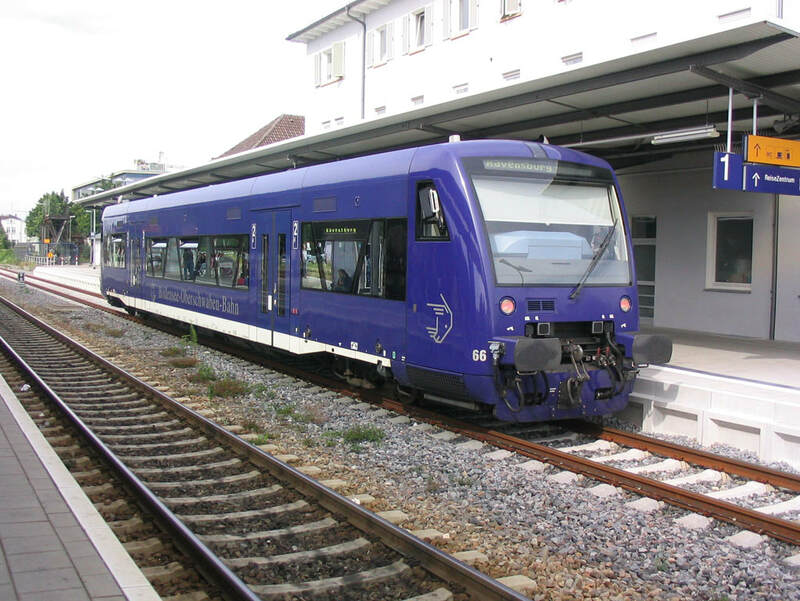 It was a Swiss electric equivalent of the 642, 742-2. A very unexceptional ride through the isolated (not an enclave – think more south Staffs) section of Germany to Rafz which is back in Switzerland. It has to be said the Rhein falls just west of Neuhausen are pretty impressive though – not to mention the Falken (Falcon) brewery next to the carriage sidings at Schaffhausen! As for mountains, none to be seen, not that you’d have seen much anyway through cloud, rain and murk. 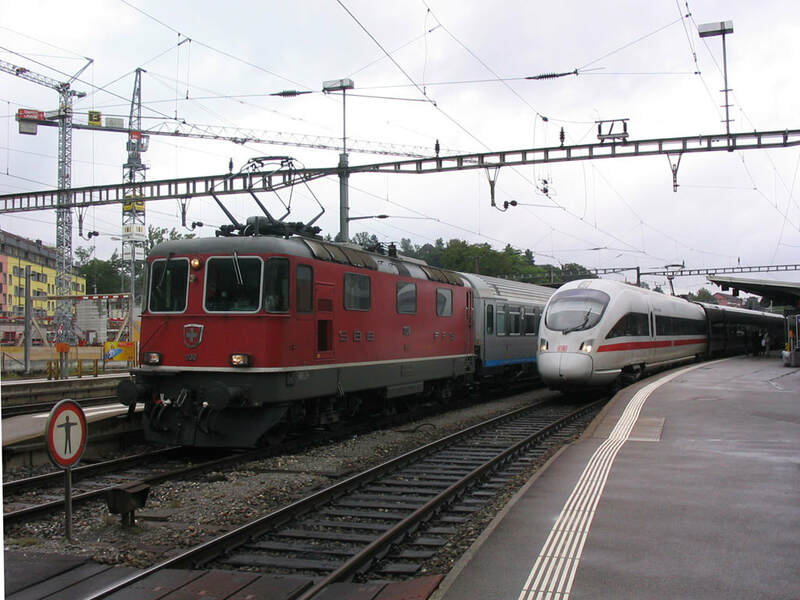 Rafz appears to be the terminus of Zürich S5 and was hosting an 8 car train consisting of two double deck, 4-car push-pull sets with the locos (Re450s) in the middle. An ICE from Zürich trundled through at about 0942 which I thought might spoil the timekeeping of the S2 but no, it turned up more or less on time and was certainly back to Swiss precision by Neuhausen. A brief excursion at Schaffhausen revealed an excellent-looking Falken pub – leave by the east end subway (turn right at the bottom of the stairs) and keep going straight along a narrow street. It’s on the left. 1015 was too early even for me so I contented myself with purchasing a can from the shop on the station (CHF 2.50, so £1.25 a pint). Well, you have to support local industry, however thriving it may look. A pretty tedious run, again, from Schaffhausen to Kreuzlingen; flat as you like and not a lot to look at. 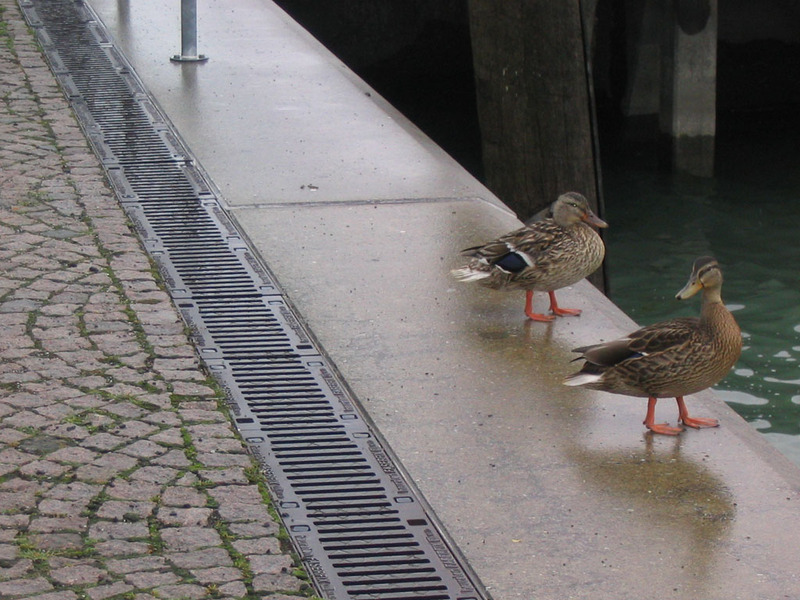 I suppose the bit along the edge of the Bodensee would be nice if it wasn’t raining… At Kreuzlingen it’s very gricer-friendly with the St. Gallen train (mine) going in first to P2, then the Konstanz connection following it in. Guaranteed overlap! On to Konstanz and a very wet walk up to Johannes Albrecht where the service was slow and unfriendly, with non-food customers being bullied into sitting at the bar (the place was all but empty). I pretended I didn’t undertand and ignored it, at the cost of having my weizen slammed down on the table. Memo: never again,* The weizen’s indifferent anyway, no wonder they only brew it here. Probably they won’t drink it at the other JA pubs. Peeved by JA I retired to the station buffet (where the Rothaus sandwich board had been clocked previously). This is a far more congenial establishment albeit the food’s a bit bland even for me! A schnitzel (with chips, no green nonsense or mayo) was partaken of, along with a couple of Rothausen. Service was prompt and friendly. Which would you choose? The second Rothaus was maybe pushing my luck, as I took my seat on the 1338 IRE at 1336 (146 pushed, loco photted) but hey, why waste time? Didn’t half leave on time too – I hardly heard the clock tick. Despite the admirable station buff I don’t think it will break my heart if I don’t see Konstanz for a while. A little chaos at Radolfzell as the IRE was held waiting for an Ulm-Basel IRE and then a freight, which in turn was held at the junction waiting for ‘my’ Basel-Ulm IRE (I was on 611 014). This left from the same platform as the Konstanz-Karlsruhe which I’d come in on. So no remaining doubts about Radolfzell then! And so to Friedrichshafen, a desperate place. With an hour to spare, I set off for the Altstadt, as you do. What Altstadt? I dare say I know who’s to blame. Settled in the end for a 650 on 1523 F-Hafen to F-Stadt, if only to get the photo I missed at full gallop en route to the Romanshorn ferry last time. F-Hafen duly photted – and a 234 on an IC to Lindau at F-stadt – it was time for the 1543 to the airport (alarmingly, running 7 late as it set off down the Hafen branch). It turned round commendably quickly though, and I was at the gate at FDN with, oh, over 5 minutes to spare. RyanAir weren’t there and were advised as 20 late. It was nearer 30 in reality. I had seat 4A this time; not bad at all. Arrival at STN was still the best part of half an hour late. The immigration queue was quite short, the car park bus was just about to leave as I dashed out, and plane to car can’t have been much over 30 minutes. Pretty good considering some idiots had tried to firebomb Glasgow Airport while I was away… To Towcester for the night rather than home, ready for work tomorrow. Russian built Co-Co 234 551, at Friedrichshafen Stadt with IC 119, Münster - Innsbruck. In October Mrs EG and I managed to find a week to get away to the Czech Republic where there was still a fair amount to be done.